You have to agree that accidents are unforeseen, and emergencies are unpredictable, they roam everywhere, and they can occur anywhere. You will also agree that the best way to deal with these situations, is by being prepared. 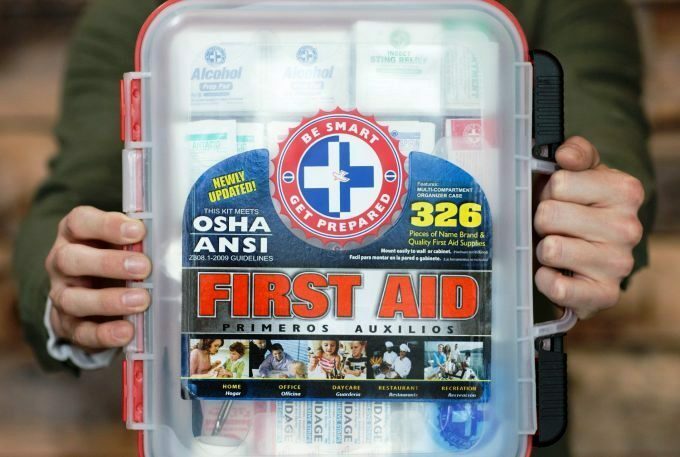 And, by having the best first aid kit, you will be ready for any bad situations that might come your way. 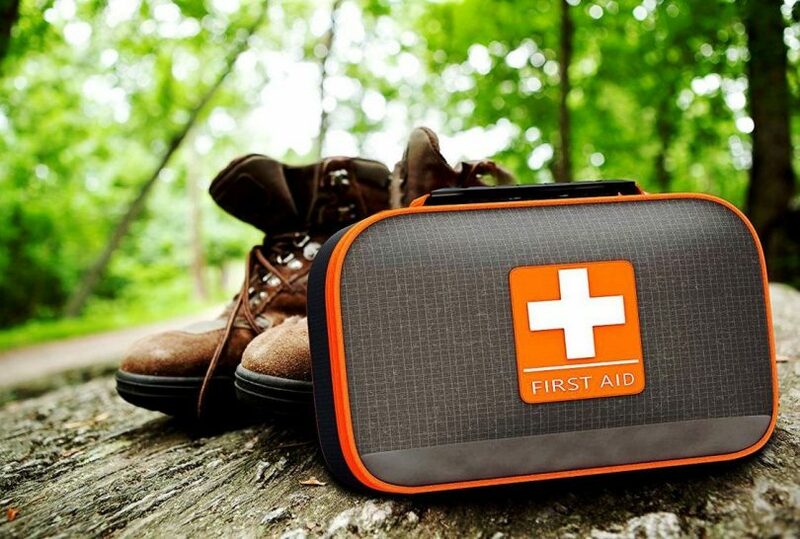 First aid kit is a must, whether just for unexpected accidents in home, or while traveling with your car, or when exploring the great outdoors. But, how to know what are the most important and useful items to have in the kit? 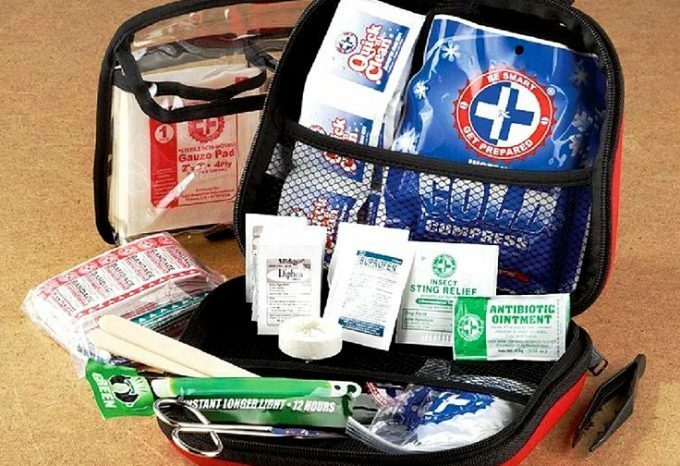 With so many first aid kits on the market, and with literally thousands of different items, putting together a life saving kit can be quite a task. That’s why we decided to help you out, do the research, and make sure you end up with the first aid kit that will suit your personal needs. In the content discussed below, we will show you some of the things you need to consider before committing to buy a first aid kit. In addition, we will also offer you the best options of first aid kits that will be able to accommodate a plethora of emergency situations, and you will also have an insight into what are the best related products that go well with the chosen kit. 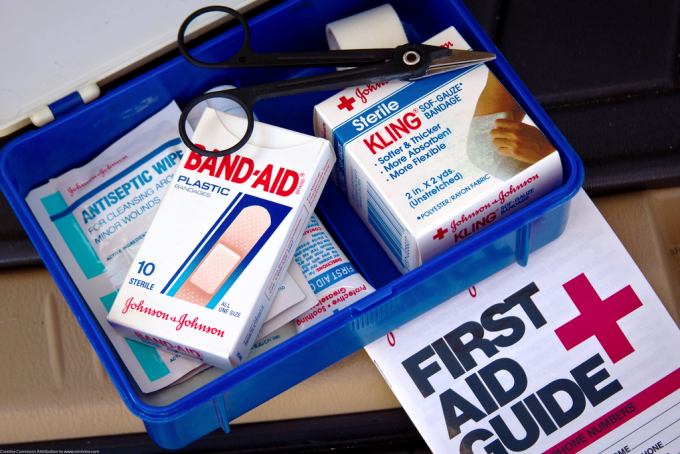 All good first aid kits should include essential equipment for treating the most common injuries and afflictions. However, none of them is complete in the full sense, so make sure you check the contents of a kit before you buy it, especially if you have an underlying medical condition that requires special treatment like asthma or diabetes. The fundamentals it should include are bandages, gauze, gloves, medical scissors, tape tweezers, and wipes. Apart from basic-care, some more professional first aid kits contains medical grade equipment, as well as survival tools like whistles and compasses. The size of your group and the length of your trip or emergency should decide the size of your first aid kit and the variety of its items. 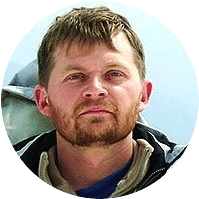 For example, a day-long hike in the backcountry requires less medical supplies, because statistically, there are fewer chances of an accident happening. If you are in charge of a large group on a long trip, it is wise to have a wider variety of medications and first aid items since the probabilities of having more than one injury are high within the group. However, ensure these things are maintained at the minimum and also take note of the people with special conditions in the team. If you’re going for fishing or a hunting trip, you need stuff that will help you with shooting accidents, like tools and medicine to treat deeper wounds. If you’re going on a hiking trip in icy weather, a first aid kit that contains emergency blankets is a real help. Insect repellent and bug spray are useful for camping in damp regions. 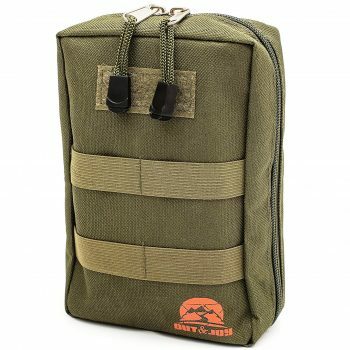 You’ll have to consider your needs before acquiring a pack that might prove incomplete or genuinely useless. But you can even add some items of your own provided you have enough space inside, so make sure you get a large, sturdy kit. If you’re on your feet most of the time, moving around from one place to another, small dimensions and low weight are essential features for an excellent first aid kit. But some products have straps and cinches to be carried on the outside of your backpack, which is even better. Besides, if you set camp at a specific fixed location, from where you leave on various day-long hikes, some first aid kits include a portable, on-the-field emergency kit that’s smaller. If you will be trekking long distances, you have to select a package which is light in weight. Make sure the design of your medical kit is durable so that it can withstand many beatings, and that it allows you easy access. That’s why we like to see a kit with big zippers, loops, pockets, resealable tops, a good organization system, waterproof exterior and tear resistant materials. There’s also an on-going debate between choosing a soft, semi-hard or hard design. While the soft exterior helps you squeeze your kit in tight spaces, rendering it more difficult to break, a harder exterior will be more resistant to tears, although less space-friendly. 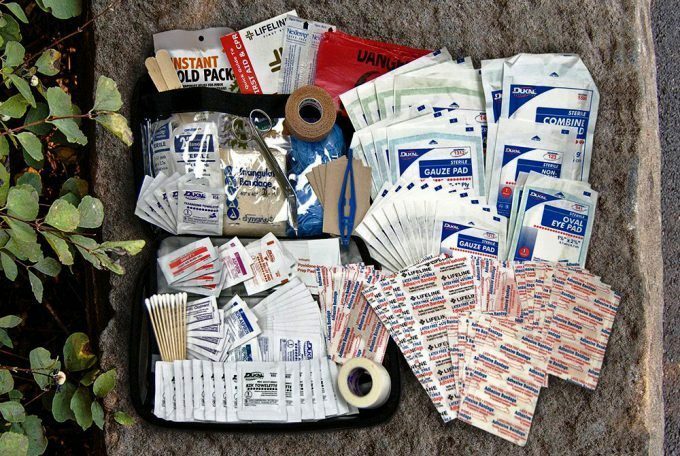 Basically, it all comes down to where you’re putting your first aid kit and how much room you have for it. Some good lifetime warranties, money back guarantees or FDA seals of approval are invaluable to ensure you’re really buying a useful kit, that’s been tested. These will protect your money in case the kit you buy ends up not viable to serve in a particular situation or condition. Apart from that, do your research regarding the brand’s reputation and if they can be trusted. Sometimes, even something as simple as including a manual or e-book gives you the confidence you’re choosing the right product. After taking into account all those features, it is evident you can now select a kit that will be of value to you. Making a purchase decision without putting into consideration such features, puts your money at stake. We have done the relevant research and come up with the best items on the market. Let’s look at their specific aspects now. 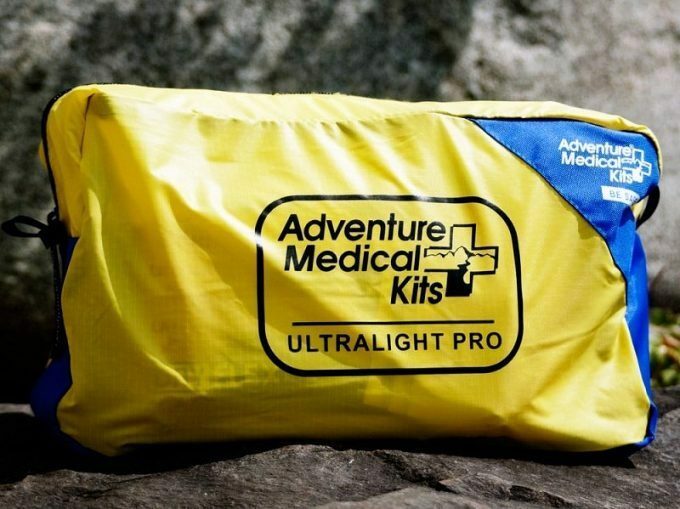 The AMK Ultralight 0.5 Solo First Aid Kit is perfect for a two-day camping trip or for urban emergencies which don’t last for very long, since its supplies are well suited for basic care. Amongst the things you’ll find inside are a painkiller, namely ibuprofen and bite relief for pain management. The alcohol, antiseptic wipes, and the antibiotic ointment are great in case you have a mild injury you need disinfecting. For bandaging a wound, you’ll find bandages, pads, clips, pins, and tape, which are all made from good materials that really hold in place. And if you happen to get a blister or a splinter, there’s stuff for that too: the moleskin pads and the tweezers. All this comes in a very lightweight bag, with small dimensions, so it’s compact enough to carry in your emergency bag or in a small backpack. You can get one for every member of your family, and it’s a pretty good deal even for kids. The outside is waterproof, and watertight too. That’s because it can be resealed after you rip the top open, and this is a secure enough system to trust. Related: An outdoor trip without a means to clean your drinking water can turn out to be catastrophic. Water has harmful bacteria, protozoa, viruses, and other microscopic organisms. To ensure you are not prone to dangers associated with the above hazards, get the Sawyer Mini Water Filtration System. It can filter up to 0.1 microns and eliminate 99.99% of bacteria and protozoa. The filtration system is lightweight since it weighs only 2 ounces. The package comes with a disposable bottle, drinking straw, and a straw. 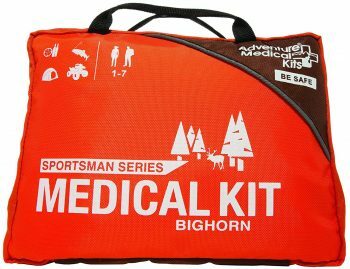 The AMK Sportsman SerieBighorn First Aid Kit is the perfect thing to have for treating specific wounds and injuries to people who go on fishing or hunting trips, as well as in rather remote locations. That’s because it’s specially designed for very adventurous people and because it has trauma-related medical equipment for treating the most usual injuries you can get in the field. For instance, apart from the basic medicine and tools, you’ll find in most first aid kits regarding wound, blister, and fracture care, there’s also a CPR face shield to account for a hospital-like care. And the best thing is, you’ll find enough of this medical equipment to last for an entire group of seven people for up to seven days. That’s a considerable time span taking into account the small dimensions and reduced weight of this package. Besides, its exterior is a bright orange color, so you’ll be sure to notice it among your other equipment too, and it’s also waterproof, which is even better. Inside, there’s a trauma kit you can take on the field when you’re not at camp. 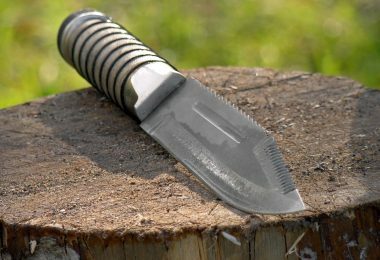 In these situations, you’ll find special tools used to treat penetration wounds you may get from a bullet, a fish hook, or an arrowhead. You’ll also find plenty of elastic bandages that have a self-adhering mechanism and even trauma pads for managing severe bleeding if there’s a shooting accident. If you’re not that savvy when it comes to medical procedures, there’s also a field manual included with lots of illustrations and dozens of first aid categories to browse through. Related: Emergency kits should not only have health-related items, how dangerous is it if you fall short of a source of light? The Emergency Essentials Liquid Paraffin Candle is made to offer emergency light for a duration of up to one week. It provides 115 hours of light, is made of plastic, and sealed completely. 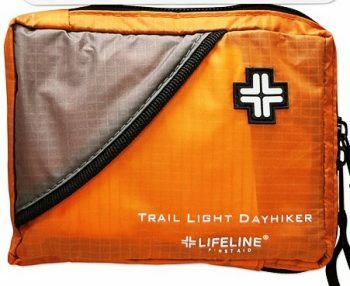 The Lifeline Trail Light Dayhiker First Aid Kit has enough provisions that render it well suited for a short, day long hike, or camping trip with a group of maximum three people. It comes in a very small case, with reduced dimensions and weight, which make it really portable in basically any sort of backpack. The bright orange color of the case will definitely signal its presence amongst other equipment, and the soft sided exterior is good in regards to flexible transportation. 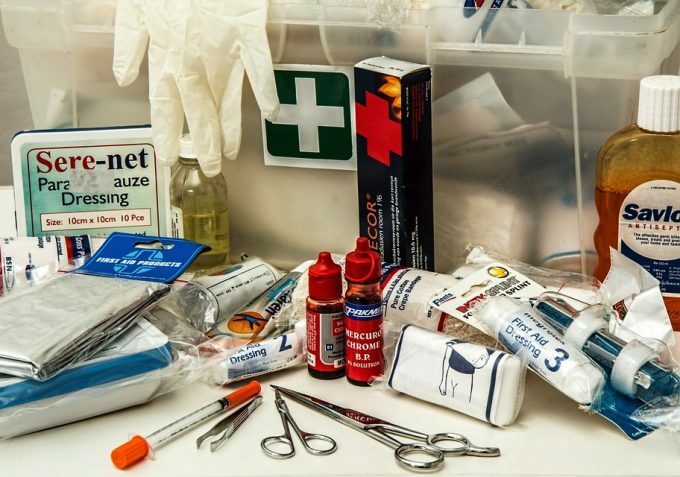 Inside this kit, you’ll find some essential medical information in the form of a comprehensive first aid guide that will take you through some fundamental notions of wound and pain management. When it comes to equipment, the essentials are also there in the form of tweezers, safety pins, applicators and vinyl gloves. The most comprehensive tools and medicine comprised in this kit can be used for treating wounds, burns, and bleedings. You’ll get different sorts of pads, bandages, dressings, and ointments treated with antiseptics and antibiotics to help you in the various stages of such an open injury. There are also some valuable additions for treating other common accidents, like choking or fractures. Plus the included medication is very helpful for managing pain, possible flu-like symptoms, and allergies on the field since there are two-pack tablets each of ibuprofen, acetaminophen, and an antihistamine. Related: Beside having a first aid kit, one more way to ensure that you are safe while on an outdoor trip is using insect repellants. 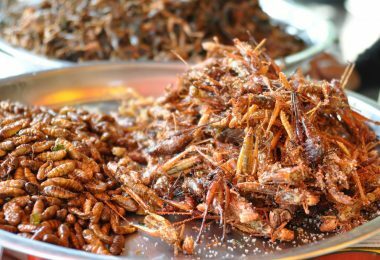 Pests and insects can be a source of infections, for example, the yellow fever mosquitos. The Sawyer Picaridin Insect Repellent is very effective against mosquitoes, deer flies, ticks and other major biting insects. 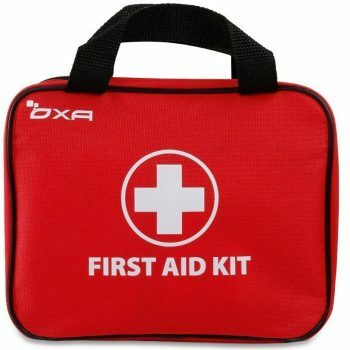 The OXA FDA Certified First Aid Kit is a real bargain when it comes to emergency preparedness during various urban disasters or hiking trips. That’s first because it contains a lot of tools and necessary medical equipment, seeing as it’s a 100pcs kit. These supplies are of hospital grade, and they’re recommended by doctors to have in emergency situations. For instance, you’ll get all sorts of antiseptics, bandages, and pads to treat some of the most common injuries on the field. But the best thing about this kit is that it comes with an FDA quality certification, which most such kits sold online don’t have. Basically, you’re getting a professional guarantee that you have in this pack everything you need to save your life in various situations. What we love more than anything else about this kit is that it further contains stuff you really need in survival situations like Compass, Disposable poncho, Emergency blankets, Sewing kit, and a Whistle. And, the overall package has a minimal amount of weight considering all this included equipment, and small dimensions too, passing the portability test. Furthermore, the bag is zipped, which makes it easy to use quickly in emergencies, especially considering that its contents are organized well too. Besides, it has a soft exterior, which makes it less prone to damage or being broken, reducing its volume too. Related: Sometimes most of the first aid kit contents are not comprehensive enough to cater for a deep wound or gunshot wounds. Seals are among the best solutions for wounds that penetrate or cause holes in the lungs of the patient. Among the most convenient seals to use is the North American Rescue Hyfin Chest Seal. It puts an airtight seal over the wound, and restores breathing capabilities of the patient. 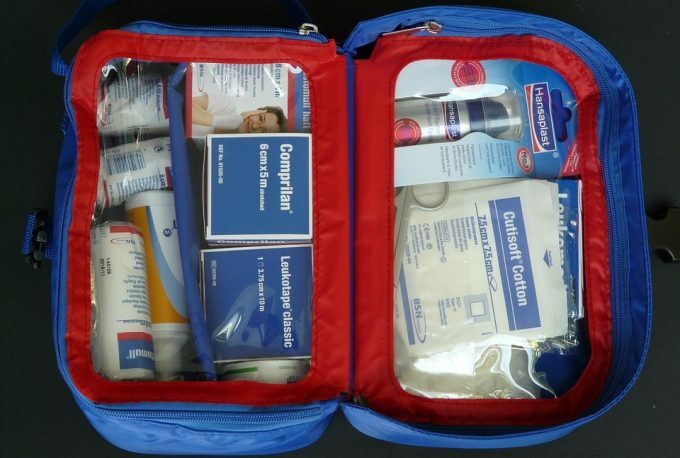 The Well-Strong First Aid Kit is very well suited for longer family road trips or camping trips in medium-sized groups. That’s because it has 210 basic medical supplies, and, all these latex-free supplies come in a very compact package, with reduced dimensions and a low weight, accounting for A-grade portability. 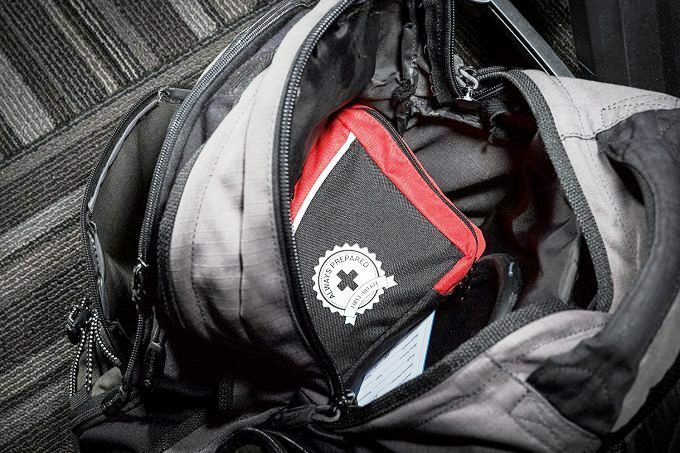 Furthermore, this means that you can fit it in your backpack or car with no hassle, especially since it’s manufactured from a soft canvas that can easily be squeezed even in a cramped place. But, this fabric is also sturdy enough to resist puncturing or tearing, so your medical supplies will be just fine inside. Speaking of the interior, this is designed with a top-notch organization in mind, seeing as you have fast access to everything. You can even refill or replace some of these items, as you use them, but it’s important to note that this kit was put together with the help of customer feedback, and with hospital grade supplies. Basically, you’ll be prepared for the most common sorts of emergencies, injuries, and accidents that can happen during your trip. Plus, you’ll get some included tips that regard emergency preparedness and how to handle emergency situations. And, if you need another guarantee, apart from the sweet money-back deal, you should know this kit was manufactured in an FDA facility. 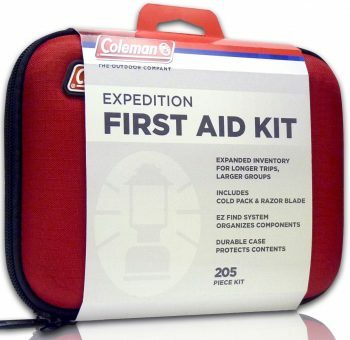 The Coleman Expedition First Aid Kit has 205 pieces worth of medical supplies to help you in various emergency situations you may encounter during a long family vacation. That’s because it has some of the most common medical equipment needed. Besides, it can fit perfectly basically anywhere in your home and in your car’s glove compartment to keep it handy. The fact that its exterior is a semi-hard case can be regarded both as an advantage, as well as a disadvantage. For instance, it’s pretty durable and resistant to damages, but it’s not exactly the epitome of flexibility, although it bends a little to fit in a reduced space if you need that. We also like the EZ find system used to organize the equipment you find inside, seeing as fast access is compulsory in emergencies. Besides, seeing as it’s a pretty inexpensive kit, its wide array of medical supplies, really make it effective for the most common treatments required. The downsides are that its outer case isn’t waterproof, and it doesn’t have any sort of burn treatment, nor alcohol wipes, which you definitely need in case there’s no clean water to wash an open wound. But, the good news is that the case has additional space inside so you can add these items on your own, or you can even remove some bandages to make more room. Related: One of the critical things that this kit lacks is a pair of scissors. The provided razor may be used in cutting bandages, but sometimes you require something to hold the cotton while applying some antiseptic or cleaning a wound. Tongs are good, but having a Madison Supply Fluoride Coated Medical Scissors is better since it has more functionality. They cut well and accommodate even large fingers. The Out&Joy Premium First Aid Kit is the perfect thing to have in two situations: either you need something very basic when it comes to emergency preparedness or you want a starting point to build your personalized first aid kit. There’s basically nothing for treating fractures or sprains, nor burns or deeper wounds, seeing as even the included bandages are pretty thin. So if you’re looking for a customizable pack, this is it: there’s plenty of room inside to add your own medicine and tools. The feature that really stands out and can be considered a valuable perk is its design. The bag is waterproof and multifunctional, it looks like a small backpack which can be attached to your actual backpack, so you can save space for other equipment that can’t be carried on the outside. Furthermore, the whole thing is actually secure since it has straps which can be conveniently looped around the backpack and then secured with snap closures. The interior construction is based on the principle of convenience too since it allows fast and easy access thanks to two qualitative zippers and a cord that keeps it open while you grab the medicine you need. There’s also a deep pocket inside and loops on the outside so you can place there the tools you want particularly handy. Related: Among the essential elements of an outdoor backpacking trip is a torch. 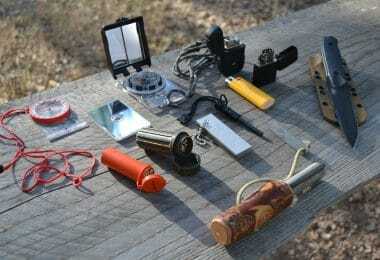 It is the only unbeatable portable source of light while on an outdoor mission. There are many varieties in the market, but given the essential qualities of PeakPlus Zoomable Tactical Flashlight, it is a better selection of your money. The torch is waterproof, has 5-light modes, and it uses AAA batteries. You can also use rechargeable 18650 lithium batteries. 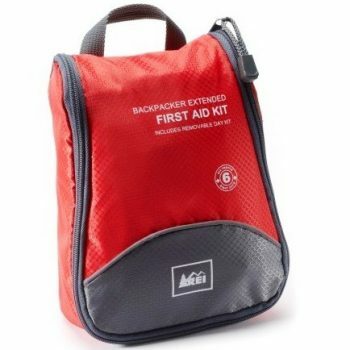 The kit REI Backpacker Extended First-Aid is perfect for when you’re camping with a small to medium sized group of about 5-people because it includes all the basic care tools and medicine required for that many people on a backcountry camping trip. The case is compact and lightweight, making it easy to carry. Besides, it’s made from a rugged nylon with a sturdy zipper for added damage resistance, but the bad news is it’s not waterproof. The design is still good, though, even when it comes to the interior and the way in which the compartments are built with a clear foldout construction, perfect for fast access. And, the best part is that it has a removable kit which you can take with you even more easily when you’re leaving camp for a day hike. If you’re not really skilled at treating even the most common sorts of injuries, you can rest assured you’ll have plenty of information thanks to the included manual. You’ll also be able to record your procedures, courtesy of the included accident records and a pencil. When it comes to the supplies inside, most of them are hospital grade. You’ll get various bandages and closures for treating smaller cuts, as well as gauze, pads, and tape for bigger wounds. Plus, you can disinfect these injuries with all sorts of antiseptic wipes, towelettes, and antibiotic creams. In case you get fractures or sprains, a wire splint is also available, and you’ll find all sorts of pain-relief drugs too. The items we like the most though are the antacid and anti-diarrheal tablets, plus the electrolyte packets for dehydration because many people encounter digestive problems when camping. The splinter forceps and the irrigation syringe are rare additions too, which are nonetheless pretty useful. Related: To ensure you have a constant supply of clean water while in or away from the camp, you can buy the MSR Sweetwater Microfilter. It costs approximately $90, and it has a pumping mechanism to make the device gravity independent. All these above products are great in their own way, and for specific purposes, so make sure you consider the accidents and injuries you’re more prone to before getting a first aid kit. Take into considerations the size, design, contents and the portability of the kit you choose to avoid getting less value for your money. 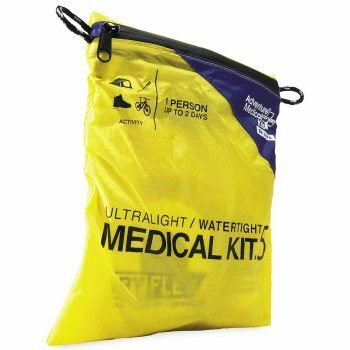 There are first aid kits that are suited for groups like the adventure medical kits sportsman series and also those that are suited for one or two people like the ultralight and watertight medical kit. The choice of what to buy depends on the size of your group and how often you intend to be going out for backpacking activities. 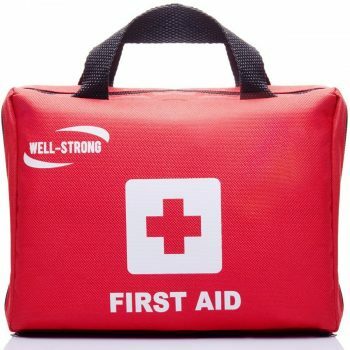 With that being said, help us settle this dispute: is it more advantageous to get an already-made first aid kit, or should you just keep your options open and customize one according to your exact needs? And what medical supplies do you find are most useful for you? Let us know in the comments section below. Internal VS External Frame Backpack: Which One do You Think it Suits You the Best?